Remember the last time you bought a new pair of running shoes? They might have been firm and tough to start with, but after a bit of wear they became more comfortable, with better grip and a noticeably softer ride. Well, you may not know this, but the same theory applies to car tyres too. Tyres are made from multiple layers and combinations of materials, such as rubber and steel. During the manufacturing process, tyres are treated with a lubricant to prevent them from sticking to their moulds during the curing stage. When brand new tyres are fitted to a car or road vehicle, this lubricant is still present. Although practically invisible, this lubricant acts as an additional layer between your car and the road and can actually be very slippery. This is one reason that tyre professionals recommend you break your tyres in. Allowing this lubricant to completely wear off the surface before exploring the limits of your tyres will then allow them to make proper contact with the road, and for your tyres to start functioning as the manufacturer intended. Why do I need to break in my tyres? As well as the need to break in the slippery lubricant, there is also a consensus that the tyres themselves should undergo a specific breaking-in period. The main reason for this is to allow all of the materials and compounds that are used in the construction of the tyre to gel together and start working together properly. 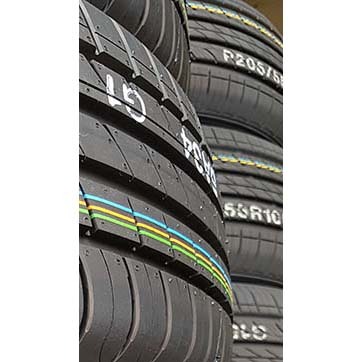 As a natural wear occurs under the load and dynamics of your particular vehicle, the fibres and compounds will settle into place and the tyre will then start to function at its best. When you initially set off to drive on new tyres, even if they are identical to the ones you are replacing, you may even notice that they feel slow to respond. This is because the tread is stiff and hasn’t had a chance to wear into a surface pattern yet. If we think of tyres as shoes for our car, it makes sense that the shoe needs to mould to our specific foot type and the weight of our body, as well as our walking pattern. How do I break in my tyres? So, how do you break in your new tyres? It is generally recommended that you take it easy for the first 500 miles. Don’t test the limits of cornering grip, and make sure that you leave plenty of braking distance to ensure that you aren’t putting yourself at risk. Remember that lubricant can take quite a long time to wear off completely. This becomes even more important in wet weather and cold or icy conditions. As the rubber tread wears down a little, you will be getting closer to the primary compound layer of the tyre and you’ll certainly notice the difference in performance, feel and ride. It is therefore important to do this for any new tyre, whether it is an off road, touring, or high performance tyre. There is often a lot of discussion and debate around this topic, and some may consider the breaking-in period for tyres as a myth of sorts. However, with the facts outlined above it makes sense to follow a break in period – this is why most tyre professionals will recommend you do this. After all, what’s a few careful kilometres initially when you have the potential to unlock much greater performance and wear from your tyres in the long term?